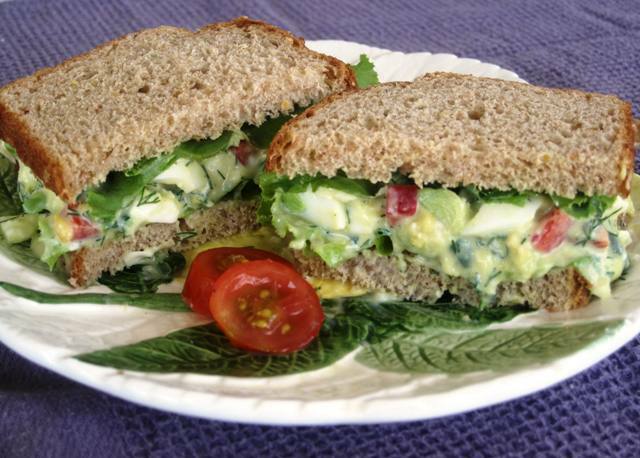 If you like egg salad, but don’t care for the mayo in most of them, you will enjoy this recipe. I personally like small quantities of Hellmann’s Light Mayo in my salads, but some of our family members do not like mayo at all, so I am on a lookout for mayo alternatives. Today I created a light version of egg salad with Avocado and Greek Yogurt. I used Light Style Pepperidge Farm 7 Grain bread, which has only 45 calories per slice. What a great sandwich it turned out to be. Yum! Place 2 eggs in a sauce pan filled with enough cold water to cover the eggs. Bring to boil and cook until done (check out this link for perfectly cooked hard-boiled eggs). Peel cooked eggs. (I like to crack the hot egg shells with the back of a spoon, then cover them with very cold water, to cool them off for few minutes, which makes the shell practically fall off the egg during peeling). Cut eggs into small cubes, and set aside. Cut out 1/4 of an avocado, peel and cube as well. In a small bowl add the Plain Greek Yogurt, chopped Chives, Dill, chopped Red Pepper, vinegar, salt and black pepper. Fold into the egg and avocado mixture. Serve on your favorite bread, with lettuce leaves, or sliced tomatoes, or both. I definitely want to try this, as you know how I despise mayonnaise 🙂 Plus the combination of hard boiled eggs with avocado sounds tasty! Actually I was thinking of you when I saw this recipe. If you don’t care for the vinegar, you can try lemon juice, lime juice, or even mustard. Next time I will try mustard as well.